Christian Nartker watches his shot on the 18th hole during Tuesday’s Union Bank Open at Pike Run Golf Club in Ottawa. See more tourney photos at LimaScores.com. 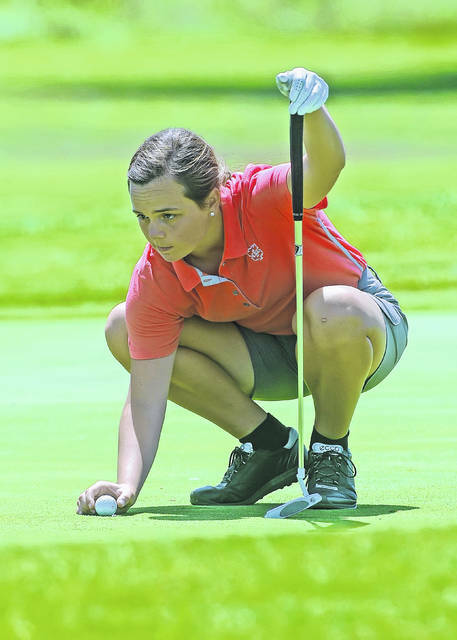 Mary Kelly Mulcahy lines up a putt on the ninth green during Tuesday’s Union Bank Open at Pike Run Golf Club in Ottawa. 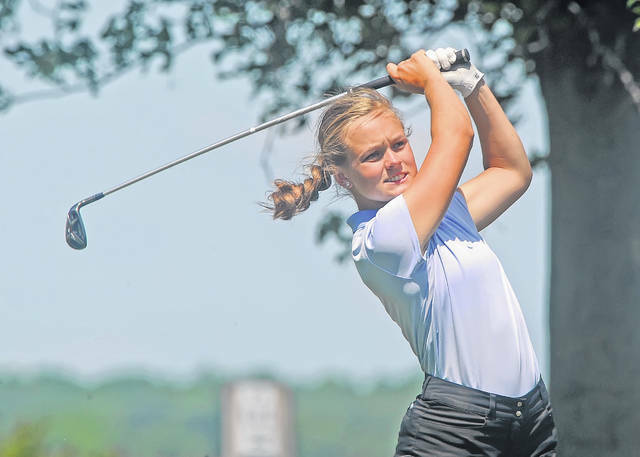 Meghan Mulcahy tees off on the ninth hole during Tuesday’s Union Bank Open at Pike Run Golf Club in Ottawa. Adam Gerker watches his putt on the 18th green during Tuesday’s Union Bank Open at Pike Run Golf Club in Ottawa. 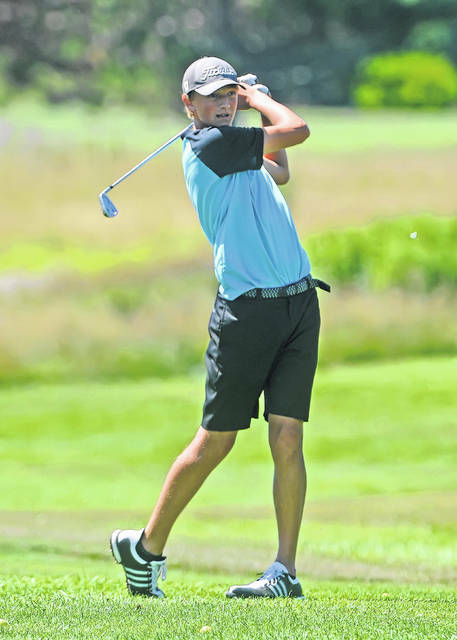 OTTAWA — Christian Nartker shot a 2-under 69 for the low round during Tuesday’s Lima Junior Golf Association - McDonald’s Series Union Bank Open at Pike Run Golf Club. Nartker won the boys 16-18 division. Jared Hernandez defeated Drew Zwiebel in a playoff for second after each shot 74. Erin Mulcahy was the girls 16-18 champ with a 73. Jill Schmitmeyer shot a 75 for second. Carson Harmon defeated Joseph Magoto in a playoff for the boys 14-15 championship after each shot 77. 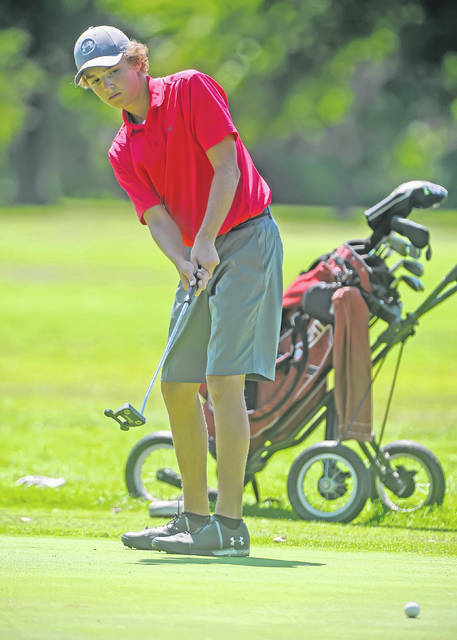 In the nine-hole par 35 divisions, Connor Nartker was the lone competitor in boys 12-13, shooting a 46. Kayla Nartker was the girls 15 and younger winner with a 46 followed by Emma Mayers with a 48. The next LJGA event is a scramble with teams of two scheduled for Thursday at Bluffton Golf Club. For more information go to tinyurl.com/LimaJuniors.